Did you ever stop to consider how many body parts you have? If you’re a medical student you probably not only know the exact number, you can give all their Latin names. Most of us, though, would guess several hundred or even several thousand, taking into account that our parts have parts. For instance, there’s the ear — that’s a part. But it has the pinna (also known as the auricle), which is the outer flap that the barber trims around. Then inside there’s the eardrum and the cochlea and the eustachian tube and some other stuff, so there are lots of parts within that part we call the ear. When we apply that to the entire body, we can reliably estimate that the total number of anatomical parts is… well, a lot. (As you can probably tell, I was not a science major.) And not to be excessively gloomy, but for every single part, there are about a half-dozen things that can go wrong with it. That’s why it is semi-miraculous that while every one of us has some sort of ache or pain or condition for which we are being treated, we are running at least as well as our automobile, which has a similar number of parts. When an acquaintance asks, “How are you?” we’re usually able to reply “fine” without stretching the truth too far. What got me thinking about all this was when I learned that, with all of the potential things that could go wrong with a body, there are people who resort to imaginary ailments to get attention. There’s a name for this condition: It’s called Munchausen syndrome. It should be noted that Munchausen syndrome isn’t the same thing as hypochondria. “People with hypochondria truly believe they are sick,” according to the Mayo Clinic staff, “whereas people with Munchausen syndrome aren’t sick, but they want to be.” Which, when you think about it, is sick. Symptoms include frequent stories about medical problems that are embellished with dramatic details, and eagerness to undergo medical tests and operations. Some even inject themselves with bacteria or toxic substances to make themselves sick. Yeesh. The doctor who first identified this condition named it for Baron Munchausen, an 18th-century German nobleman who told stories of his adventures and exploits that bore little connection to reality. 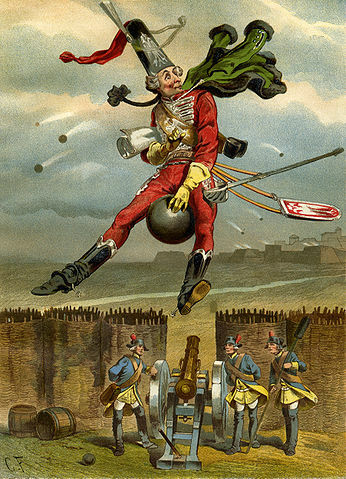 Among his tall tales was a story about narrowly escaping injury during a battle by hopping onto a cannonball and riding it. Nope, I’m not buying it, Baron. You just can’t do something like that without harming some of those many body parts we have. Just among friends, we’ll probably admit to each other that not all of our thousands of parts are still functionating at 100%… but since we don’t have any imaginary illnesses, we can’t complain, right? This entry was posted in Science and tagged Baron Munchausen, Munchausen syndrome. Bookmark the permalink. A number of years ago, I read Julie Gregory’s memoir “Sickened” about growing up with a mother who had Munchausen by proxy (MBP). Like Munchausen, the condition is a cry for attention from medical professionals, but tragically it compels caretakers to create sickness in their children. Interesting read but very scary stuff. You’re right — very scary. That condition is known by other names, including Factitious Disorder by Proxy, but what it amounts to is child abuse. Fortunately it’s very rare, but that may be due in part to the difficulty doctors have in identifying it. As for the adult version — Munchausen syndrome as discussed in the blog post — I just can’t wrap my mind around the illogic of making yourself feel better by making yourself sick!